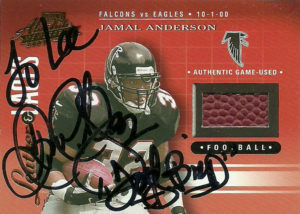 Jamal Anderson was a 7th round pick out of Utah in 1994. He had two decent seasons for the Utes, rushing for 1275 total yards on 223 carries, while catching 35 passes for 342 yards. It wasn’t head turning by any means, and by the time he was drafted nobody really was watching at home. His rookie year was far from impactful. In fact, Anderson had -1 yard on 2 carries, but hand it to June Jones’ coaching staff. They saw something in the Dirty Bird and allowed him to flourish. It was in 1996 that Jamal had his first 1,000 yard season on 232 carries. 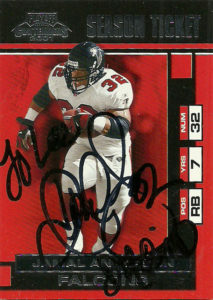 An encore was provided in 1997 when he rushed for another 1002 yards on 290 carries. He’d have a career year in 1998, leading the Falcons to their first Super Bowl appearance rushing a league leading 410 times for 1846 yards and 14 TDs. An injury wrecked his 1999 season, but he came back in 2000 to again eclipse 1000 yards with 1024 on 282 carries. Injuries though caught up with Jamal and after 2001 he’d retire. Like the great players before him that defined an era of football with their style such as Billy ‘White Shoes’ Johnson (Funky Chicken) in the 70s and Ickey Woods in the 80s (Ickey Shuffle) Jamal was the originator of the TD dance called The Dirty Bird. In it after scoring a TD Anderson would get up and strut around flopping his arms like a bird. It became a sensation after the Falcons’ Superbowl appearance, and is considered now part of NFL lore. Anderson has been involved in sports media/ broadcasting since retirement. He’s also a member of the concussion lawsuit against the NFL. Jamal had some nice cards out there. At this point, the different card manufacturers had figured out that fans valued design and were really working on improving the quality of it. Among the entries into the market was Atomic- a kitsch card design with die cut edges. I’ve gotten a few of these signed over the years and I’ve always liked them. The Playoff Memorabilia card with the football swatch is actually game used- down to identifying that it was from a game against the Eagles in 2000 when Jamal carried the ball 19 times for 42 yards. I thought that was a nice touch.